Above: Sunset on the Thompson Falls helibase, Copper King fire, Lolo NF August 2016. Time continues to fly by at a rate that would be alarming if I wasn’t in classic “heads down” mode trying to power through the remainder of fire season. I haven’t been busy in the traditional sense – I’ve been on fewer fires and worn my yellow less than last year – but somehow I’ve been busier than I have been for the past couple of fire seasons. I’m still on the road more often than not it seems. Such is life in the wildland fire game. Winter will come eventually, and with it a slowing of pace. As August was getting started I found myself heading to the Copper King fire near Thompson Falls, MT, on the Lolo NF as a helicopter manager. As assignments go it was a bit different, with a lot of down time as unusually cool and wet weather set in for the bulk of my two weeks there. Regardless of the tempo, it was a good assignment all around… I spent a few days as a trainee, a few days as a trainer, and a few days as helicopter manager on a UH-1H. I saw people I hadn’t seen for a few years, worked with some familiar faces, and met some new folks from near and far. Getting back out on a fire in an aviation role is always good for my outlook on life. Somewhat ironically, fire behavior picked up not too long after I left, making me wonder if my oft-joked about bad (or good) timing with favorable fire weather (rain in particular) is still in effect. 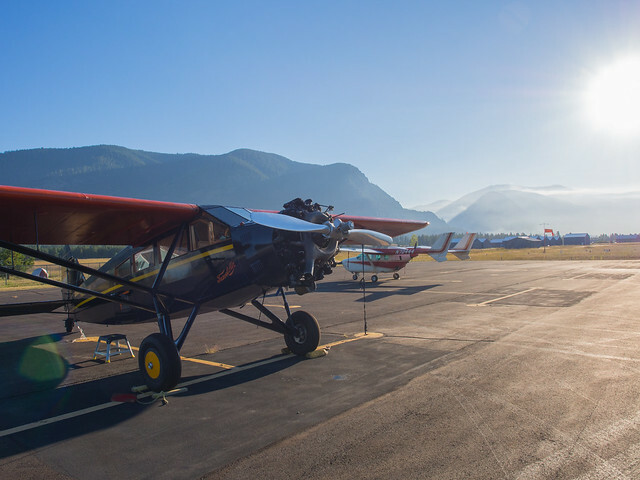 Above: 1929 Travel Air, a sister ship to one used in the early days of smokejumping in Montana and Idaho, Thompson Falls airport, MT, August 2016. After my assignment I was able to take my R&R days in the Swan, at mom and dad’s, which was also good for my outlook. Mom was out on a fire assignment of her own, on the California coast of all places, but dad kept me busy, running errands, splitting wood, and helping with some house painting. Getting out of the city (if you want to call Boise a city), both for my assignment and the R&R days that followed, was good for me. While I can survive in the urban wild, it’s not where I feel most at home. 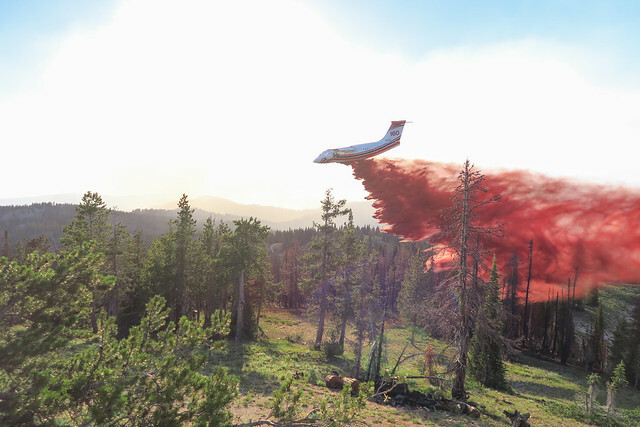 Above: Tanker 160 dropping retardant around a structure, Pioneer fire, Boise NF July 2016. 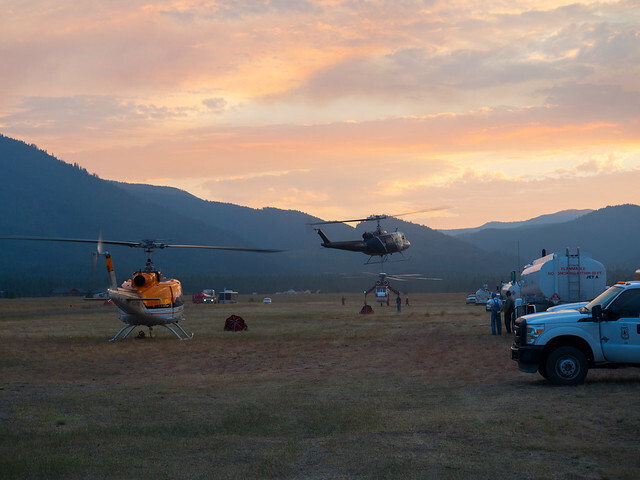 Earlier, July went by in a blur of activity, with a few road trips to the right place at the wrong time (for fire activity) and a little bit of work on the Pioneer fire up by Idaho City. That fire is still burning as I type, and it grew quite a bit since we were there a month ago. It was kind of interesting setting up our main observation point at Pilot Peak, as we’d collected data on a fire there the previous year, and you could still see the retardant on trees in some places. On the Boise NF fire is a frequent visitor on the landscape. So I stroll into September, not quite sure of what the rest of this strange fire season will bring. Nothing thus far has gone quite like I thought it would, so I have no doubt that the trend will continue. In the meantime I remain hopeful that I’ll have more opportunities for spending time with friends and family (on the fireline and off), and writing, and if I’m lucky, some photography as well. Ah, the never ending Copper King. It’s still going! I almost went back. My helicopter had an emergency landing there after we both left. 😉 got the leadership books (thanks), I’m looking forward to winter too!